I used a combination of wool and Hobbs 80/20 for the batting. I used So Fine, and Glide thread for the top and lots of it! This quilt took me 70 hours to quilt. This is my first time quilting a Lone Star Quilt and at first I was a little intimidated. I wasn't sure how I was going to quilt it. I wanted it to be unique and all my own, plus I knew that I needed to have a lot of quilting in the quilt because that is what I do and what Joe and Nan like. So, I stared at the quilt for several months, then realized I better just get going on it. All the quilting designs were designed as the quilt was on the racks. I wanted to show this picture because the sun caught the thread's shine just right and I am pretty proud of the small quilting. 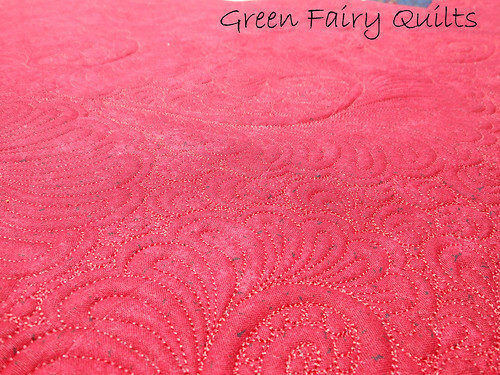 I really take my time to quilt around these swirl feathers and the time it takes is worth it! Here's another shot. 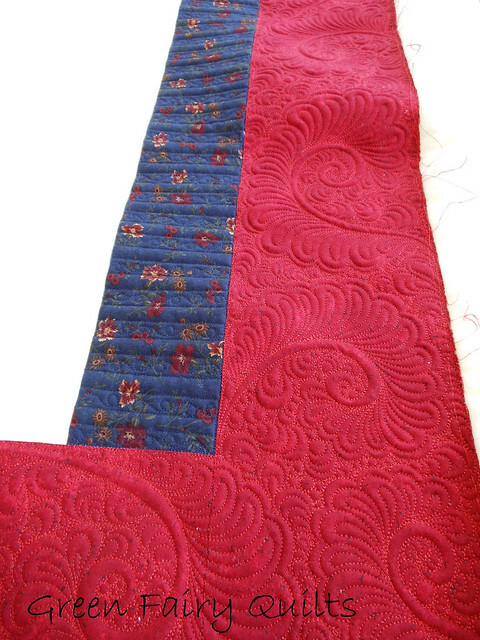 I had a lot of space at the bottom of the quilt top and this free motion feather swirl plus fillers was just the thing. 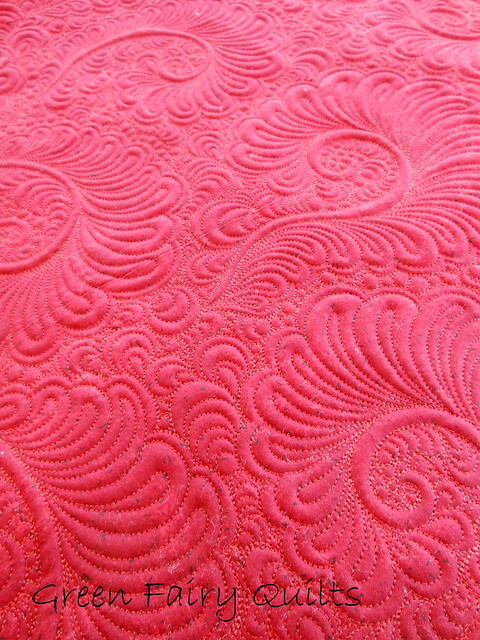 If you are wondering, I didn't draw any of these on, each feather swirl is different and free motion quilted. I did a simple straight stitch with loop for the smaller blue border. This is what I would like to call a happy accident. I really didn't know what I was going to put in these large white square areas, but I played around with my ruler and this is what I came up with. 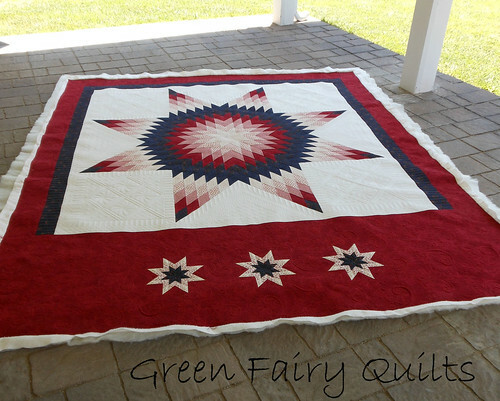 The feather centers are free motion and were so fun to quilt up! What a cool picture! I seriously love this quilt! Inside the star diamonds I did a double connecting curve with a squiggly line from top to bottom. These areas were huge, but so fun to quilt up! I love the process of this quilt, not happy that it has been on the racks since the first of April, but I am so happy to be finished and get started on my next project. Hopefully it won't take me as long. 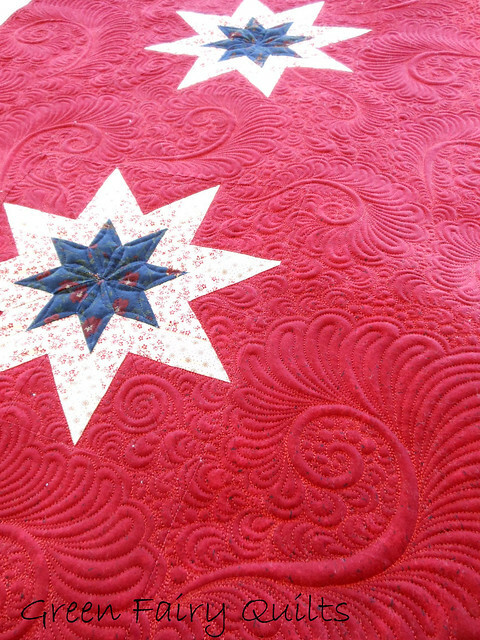 Your quilting always just blows me away! It is amazing!! What a great job you did here....I am sure they are thrilled! Just glorious!!! I love it too. What wonderful big blank areas to work on. I would feel intimidated too. Wow, can I study with you? Breathtaking Judi, and wonderful to think that you're helping create such beautiful quilts that hopefully will be treasured by many future generations. Stunning! You always come up with something new, and over the top. I love it. 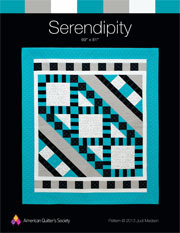 As always you inspire me to try new things in my quilting. Amazing!!!! I'm always in awe....when I look at your quilting! The feathers are absolutely gorgeous and I LOVE what you did in the open areas, perfect!! What an Amazing talent you have. Each quilt you show us is just fantastic. Your quilting is unique. Stunning and beautiful too. Each one I see takes my breath away. Believe it or not, I don't throw out compliments just any old time. You deserve them. I think you must have a few extra creativity lobes in your brain that the rest of us don't have. Your work is in a class by itself! I saw I got your last Fat Quarter Pack of Lucy's Crab Shack - hope your hubby didn't accidently snag yours. LOVE it! Absolutely breath taking, as always. Your quilting constantly amazes me. LOVE it! 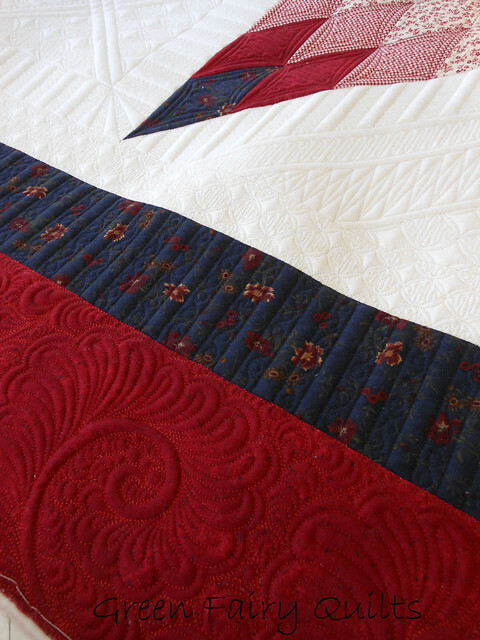 That's probably one of the most beautiful quilting jobs I've ever seen! You're so talented! Absolutely a-m-a-z-i-n-g!! Such talent--you are in a class by yourself! 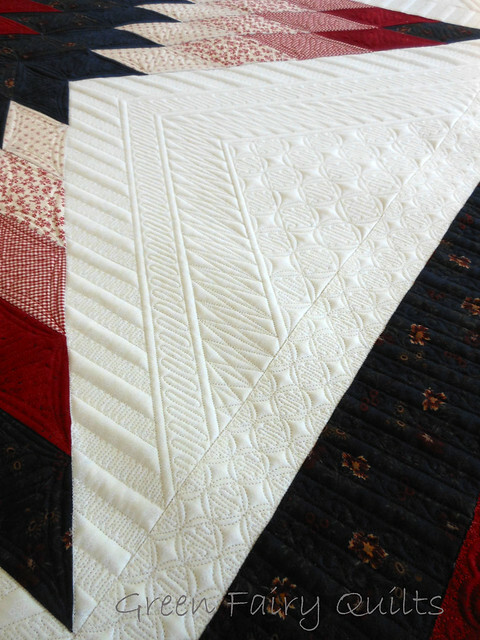 Your quilting is eye candy, and this quilt pure genius! You rock!! OK... this is just...well there are no words. LOL. Let's make up a new one: Stun (stunning)-fab (fabulous)- ible (incredible). Your quilting belongs in a museum. And a beautiful job you did too! 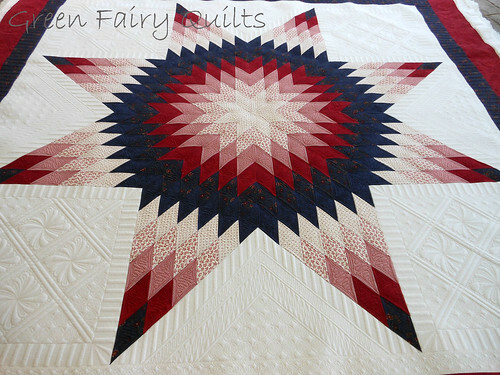 Thats a gorgeous Lone star quilt. 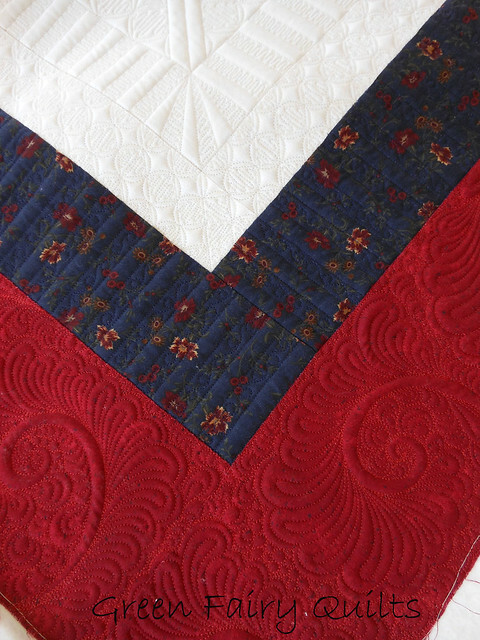 I too would love to learn from you, stunning quilt, could I ask what the cost is for that kind of quilting..
Of course her quilt is gorgeous...but your quilting is seriously amazing...just love it! You are AMAZING!!! I hope at night when you lay your head down on the pillow that you say to yourself I am the bomb digity. Anytime you want to quilt my jeweled wedding ring quilt I will let you. I will save it until you are ready. You've created another stunning quilt. Just superb! Hope Nan and Joe love it as much as we do. How in the world did you give that quilt back?! 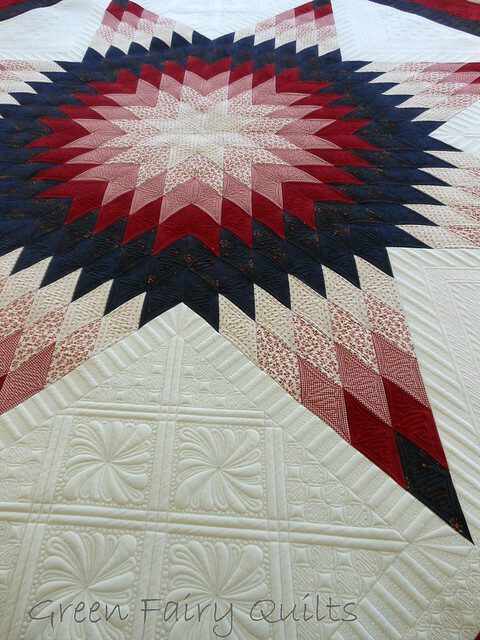 That is stunning work from the piecing to the quilting. I love love love that quilt. As always, your quilting is absolutely amazing!! You are such a talented lady. Stunning...your imagination is wonderful. You always do new designs. Love it! Absolutely STUNNING Judi, Its really lovely and you can be justifiably proud! Wow. You have such talent. Your quilting is amazing. You have a right to be proud of this work. So creative and completed with such skill! Wow, just WOW! OMG! This is a spectacular work of art! I'm just amazed at the talent! in a word - STUNNING! 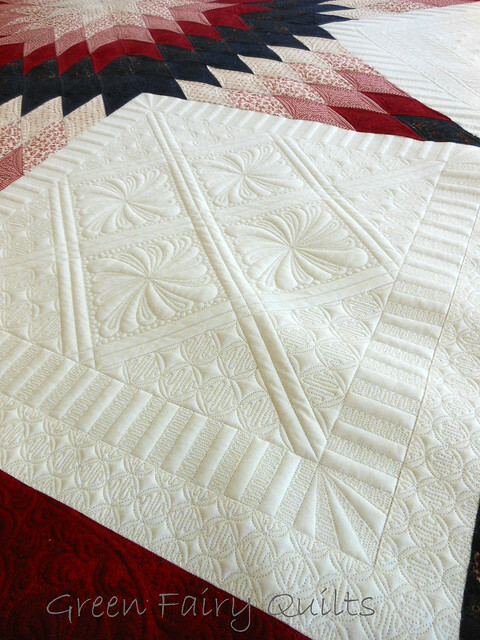 Your quilting is beyond beautiful ~ incredible!! Now I'm off to see where you live and if it's feasible to send my quilts to you! Judi, you gave this quilt life. 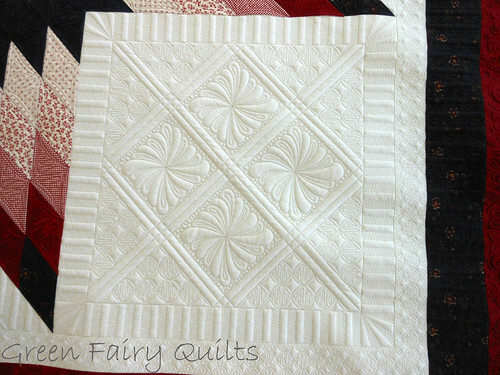 I love the fantastic quilting on it, you're a true inspiration! I also love the blue and white quilt you quilted for them, they're lucky to have you quilting for them. Thank you so much for sharing you pics! Judi, this is incredible. You are so talented. WOW WOW WOW WOW WOW!!!!!!!!!!!!!!!!!!!!!!!!!!!!!!!!!! THAT IS SOOOOOO PRETTY!!! You have amazing talent!!! Just had to say it even though I'm sure you've been told a thousand times over! Judy, you have a gift for this. A God given gift. Pure and simple. I'm happy that you found this outlet at such a young age. I'm glad you have a super family to keep you grounded!! And focused. Do be sure and do some of your own projects though. You need that outlet for your sanity! Maybe someday I can afford to send you a quilt to quilt for me!! Your quilting is just amazing to me!